Includes the nearby Jade Dragon Snow Mountain. Places include: Jade Dragon Snow Mountain, LiJiang old town, ShiLin Stone Forest and KunMing city, the provincial capital. Yu Long Xue Shan (玉龙雪山), near LiJiang, in YunNan province. The highest peak is named ShanZiDou (扇子陡) - 5,596 meters / 18,360 feet. 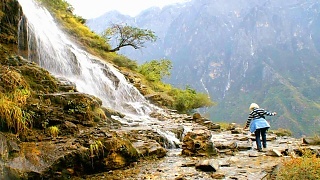 On the far side of the mountain lies Tiger Leaping Gorge (Hu Tiao Xia / 虎跳峡). LiJiang old town is one of the best preserved in China and is home to the Naxi minority. Nearby attractions include the Jade Dragon Snow Mountain and Lugu Lake. A clip of the outdoor show. It is one of a series named 'Impression ...' in different places around China that highlight traditional folk culture and natural scenery. Part directed by acclaimed film director Zhang Yimou, who also directed the 2008 Beijing Olympics ceremonies. 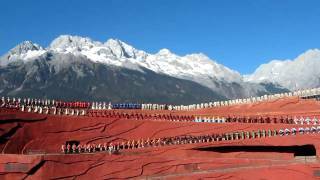 The location here is in front of Jade Dragon Snow Mountain (Yulong Xueshan).